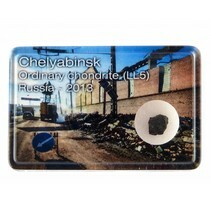 Russian meteorite 2013 for sale.Real pieces of Chelyabinsk or Tsjeljabins meteorite from Russia for sale. The impact was on 15 februari 2013. We have nice individual pieces with a melting edge. The Russian meteorite is back in stock! Now in nice display boxes. The impact of the Russian meteorite on 15 February 2015 in Chelyabinsk was the heaviest meteorite impact in the past 100 years. 1200 people were injured, mostly by flying glass due to a huge explosion. The Russian meteorite is actually an asteroid. Like planets, these pieces are turning in a private circle around earth. The size of the asteroid upon entering the atmosphere was about 19 meters. Three quarters of the asteroid was burned up in the atmosphere. About 30 km altitude there was an explosion with a force of 500 kilotons TNT (for comparison, the Hiroshima bomb was 15 kilotons) The shock wave went 2 times around the earth. Ultimately, only 0,05% of the original mass came on earth as a meteorite. 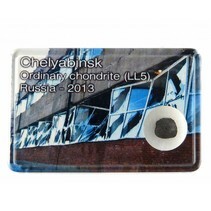 The Russian meteorite is classified as a LL5 Chondrite, also known as a stone meteorite. They meteorites come in nice display boxes with a mixture of images from the meteorite impact as seen on the news. Pick your favorite of collect them all!